LONDON: A 3,000-year-old carved stone tablet from Babylonia, which promises a curse on those who would destroy it, is to be flown home from Britain after being looted during the Iraq War, reports AFP. British Museum boss Hartwig Fischer handed over the priceless work to Iraqi Ambassador Salih Husain Ali during a ceremony on Tuesday after museum experts had verified its provenance. “It is a very important piece of Iraq’s cultural heritage,” said Fischer, praising the “extraordinary and tireless work” of border officials. They spotted the object at London’s Heathrow airport in 2012 and contacted the museum after being presented with fake documents. “They seized this item when they saw it at a British port and several years later, after a lot of legal work, we are able to effect this transfer,” said Michael Ellis, Britain’s Minister for Arts, Heritage and Tourism. It is still not clear how the object was taken out of Iraq, “but we believe it was probably stolen about 15 years ago during troubles in Iraq,” he said. 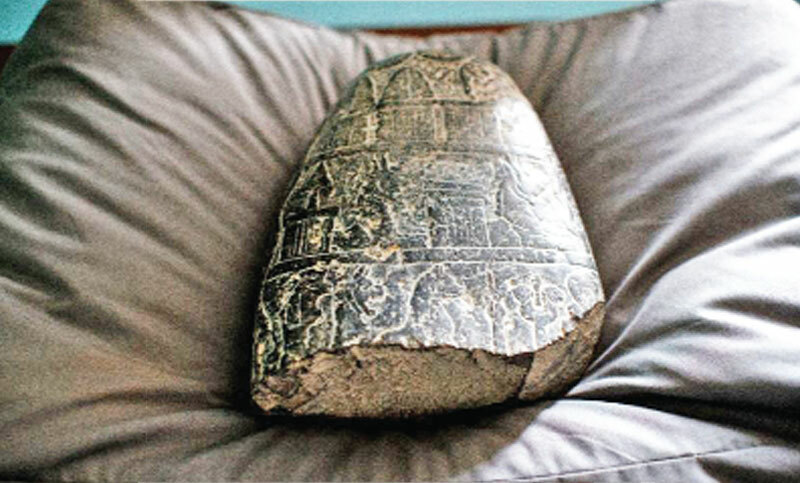 Taylor said the object also carried “terrible curses” for anyone trying to claim the land or damage the tablet. “The basic identification is quite straightforward,” said Taylor. They established the king was Nebuchadnezzar I, “a kind of national hero, a legend in his own life time”.